Heeeeyy! It’s been a bit hectic around these parts–my mom is in town and it’s always a whirlwind of eating and doing while she’s here. There has been a lot of yard work–planting flowers and herbs and watering all manner of greenery. There have been trips to Home Depot and Ikea, Powell’s, the Oregon zoo, and even the coast. There has also been a ton of eating. So much food (see my Instagram feed for a teeny glimpse). It’s always so fun when my mom and Mel–my mom’s husband and Casper’s “Papa”–they adore Casper, and he loves them. Plus, everyone gets along super well. It’s good times. Also good times is this iced coffee beverage. I saw both Nicole and Jessica make iced coffees with coconut milk and I just jumped right onto that caffeine-wagon. 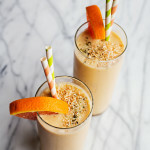 I added toasted coconut and rum to mine because sometimes I like a little boozy-weekend brunch drink and sometimes I like a little coffee-dessert-drink. 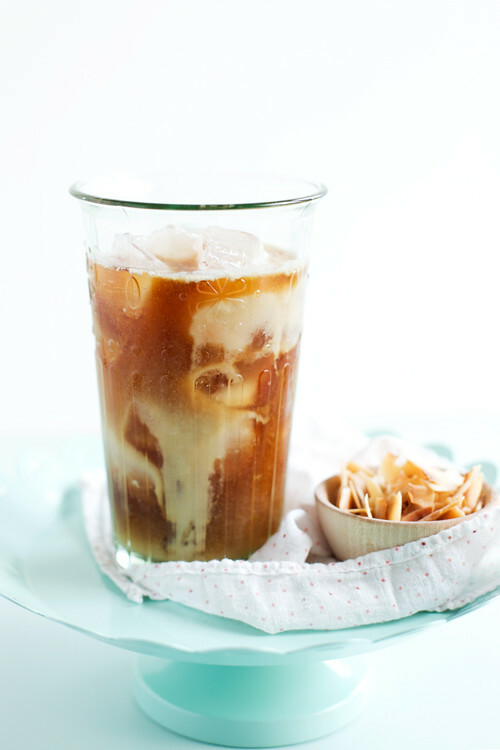 This Toasted Coconut & Rum Iced Coffee satisfies both of those things and is super easy, to boot. 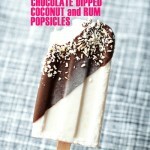 Like an indulgent iced coffee thing (a la Starbucks) but…you know…drunk. CHEERS! 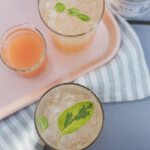 A boozy, pick-me-up full of toasted coconut flavor. Preheat the oven to 350ºF and spread the coconut on a sheet pan in an even layer. Bake the coconut in the oven for 5 minutes, stir, and repeat until the coconut is golden and fragrant. Remove from the oven and set aside to cool a bit. Heat the coconut milk and brown sugar in a saucepan, add the toasted coconut and bring the mixture to a boil. Turn down the heat and simmer about 10 minutes. Remove from the heat, cover and allow to steep, about 20 minutes, before straining out the coconut flakes. Pour the toasted coconut creamer into a jar and fit with a lid. Refrigerate until ready to use. Combine the ground coffee and water in a glass container (I like to use an 8-cup glass bowl with a spout, like a large measuring cup) and stir to combine. Cover and steep the coffee at room temperature for 8 to 12 hours. Place a strainer over another large bowl and place a coffee filter into the strainer. Strain the coffee through the filter lined strainer. Do this in batches if needed. Pour the coffee into a pitcher. 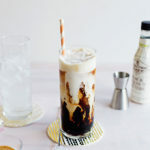 In a tall glass combine a few tablespoons of the toasted coconut creamer with 1 ounce of rum (I used a coffee-infused rum) and a cup of the cold brewed coffee. Top with ice and stir well. 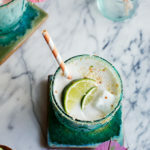 Garnish with whipped cream and toasted coconut flakes. Oh my gosh, this sounds so heavenly! Love this whole coconut milk iced coffee thing. I am definitely making this version! It looks like you’re having so much fun with your mom! It’s so sweet. I love your iced coffee drink. Good call on boozing it up! This is one delicious looking boozy shot of coffee! 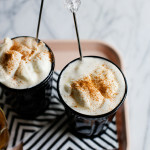 Another good alternative to dairy whipped cream is Truwhip. I love regular whipped cream, hate cool whip and like Truwhip. Whenever I hear someone went to Powell’s, I giggle a little bit because that’s my last name. I know, so mature. Anyway, it sounds like your having a great time with the family! Plus, drunk iced coffee is totally my jam right now. You know, cause it’s nice to be really awake during your later afternoon buzz haha. Gorgeous photos as always! I love coconut! 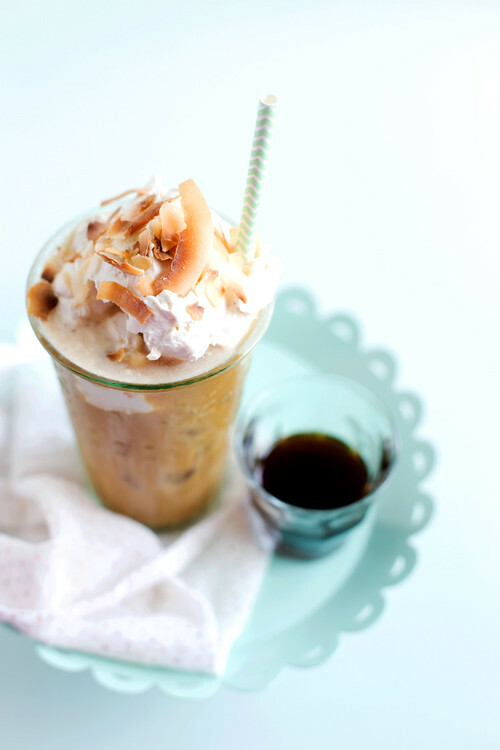 Coconut mixed with coffee…I am in heaven. Loved the recipe.